I am not really a good singer but I can sing a tune. I was a member of our school choir during high school days. Then when I was working in school, the non-teaching employees formed a choir which we called the "Nightingales." We used to sing whenever there is a mass at the chapel. 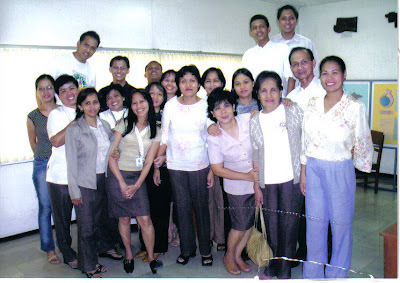 This one here is the picture of my and my classmates in graduate school. 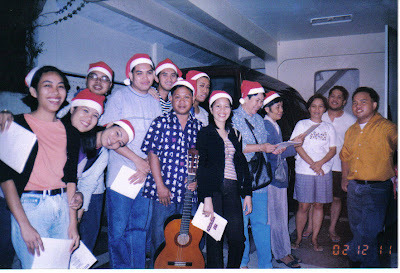 We organized a Christmas Carol which aimed to gather funds for our social work. We caroled at the house of one of our professors. 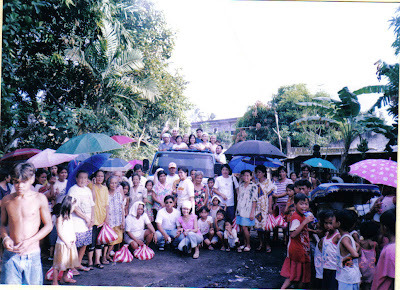 We bought can goods and give it to the poor families in Daraga, Albay. Can you spot me in the photos? Sobrang saya siguro ng mga choir days mo Mare. Yung sa first and 2nd photo i can tell where you are but the last one di na...baka naduduling na ako lols! hugs! I loved it that you are still able to share old pics of yours, mommy rose.. I'll try to halungkat our baul when we get back to pinas.. hehe.. Thanks for your comment on my blog post today. I liked your pictures too. Looks like a lot of fun singing with your choir friends. I love to sing but can't reach every note since I have had nodules on my vocal cords. But I do love to listen to beautiful music. Aren't you glad you still have your photos to remember your good-old-happy days? I bet you can sing very well. I have yet to meet a filipina/filipino who can't!!! I wish to hear you singing, Rose. Pinamana mo ba yan sa mga tsikiting mo? I can sing but not solo! I see you, so poised! That's wonderful! I bet you all had so much fun together! I sing in my car and in my shower...I don't want to make other's ears hurt. I love that you were in choirs...I love to listen to them. choirs or singing groups are fun. it deepens the love to sing and music and also deepens the friendship with everyone in the group. Talagang smiling face ka maski nung dalaga ka pa kaya madali kang makita sa litrato, lol. Me pagka model ang posing mo maski nung dalaga ka pa, lol. Very active ka rin pala maski nung nagaaral ka pa. Sana makapag up load ka nang music video mo sa Utube at i feature mo sa blog mo, lol. Thanks for the post. God bless you all always. Mahilig ka pala talaga sa pagkanta, sis. Oo nga, minsan magpost ka ng video mo while you're singing, at irerate namin, hehe. i love to sing, too. sadly, ayaw ng kanta sa akin. lol. wow, what a great memory you've got sis, I was also involve in a choir before when I was in college. I've got scholarship, it's fun! Sorry that I came here very late. Ganda nga ng boses mo sa phone, kanta ka nga ng bayang magiliw bakla...hehe. The one thing I wish I could do is sing! I am making sure my kids get lessons. Annika is 2 and Luke is 4! They are at such fun ages!